Comilla Victorians are the professional T20 Cricket team in the Bangladesh Premier League (BPL). 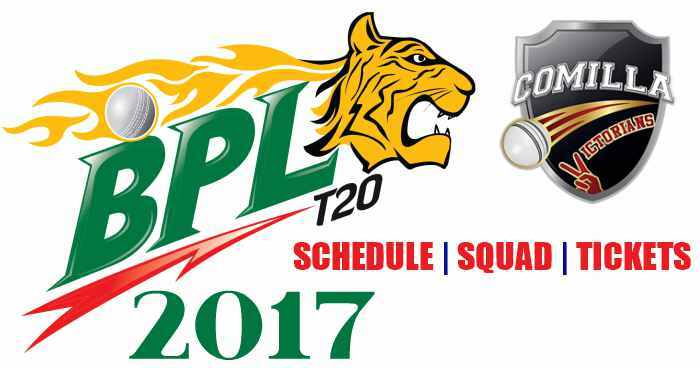 Comilla Victorians first participated in the third season of BPL (2015) and currently is the part of BPL 2017. Comilla Victorians are owned by the A H M Mustafa Kamal, daughter of the planning minister of Bangladesh, under the name of Legends Sporting Limited. Comilla Victorian won the title in the third season of BPL (BPL 2015). Comilla uses Sher-e-Bangla National Cricket Stadium, Dhaka as their home ground. Comilla Victorians have some famous international T20 players like Darren Bravo, Shoaib Malik, and Jos Butler. The team will play under the captaincy of Imrul Kayes and Mohammad Salahuddin will be the coach of the team. Tamim Iqbal, Imrul Kayes, Darren Bravo, Marlon Samuels, Shoaib Malik, Jos Buttler, Solomon Mire, Mohammad Nabi, Rashid Khan, Hasan Ali, Rumman Raees, Fahim Ashraf, Imran Khan jnr, Mohammad Saifuddin, Al-Amin Hossain, Liton Das, Arafat Sunny, Alok Kapali, Mehedi Hasan Rana, Enamul Haque, Raqibul Hasan, Mehedy Hasan. Comilla Victorians will play their first match on 5th November 2017 against Sylhet Sixers at Sylhet International Cricket Stadium, Sylhet.